Walt Disney World's one-day ticket prices at its four parks are going up effective tomorrow according to the Orlando Sentinel by $2, to $52 for adults and $42 for children, plus tax. A Disney spokesman is quoted as saying that the increase (the park's first since September) is being made "for business reasons" but is not tied to any forecast for summer attendance. Disney's four-day adult pass rises to $208 from $199 and the five-day pass to $269 from $259. Certain discount deals, such as for Florida residents and Annual Passholders, are unchanged. 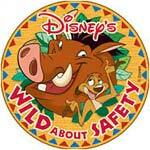 Continuing its long tradition of safety leadership and storytelling, Walt Disney Parks and Resorts officials today announced the new Wild About Safety campaign, an entertaining educational program that uses two of Disney's most popular characters -- Timon and Pumbaa from The Lion King -- to educate guests about resort safety in a fun and uniquely Disney way. Radisson Resort Parkway Releases Great Rates! New discount prices for the remainder of 2003 have just been announced at the Radisson Resort Parkway - Orlando Disney Maingate. Standard rooms are being offered from $59+, per night. Kids stay and eat free! The resort is conveniently located just 1.5 miles from Walt Disney World with free shuttle service. Amenities include a variety of dining options, spacious newly remodeled rooms, tennis courts, playground, game room and so much more! Disney has released the 2003 dates for both "Mickey's Not So Scary Halloween Party" and "Mickey's Very Merry Christmas Party". These are hard ticket events. Guests must purchase a separate ticket to attend. Tickets went on sale April 30, 2003. Walt Disney World limits the number of tickets sold in order to keep the crowds down and many dates sell out in advance. Call (407) W-DISNEY, for your tickets today! "Mickey's Not-So-Scary Halloween Party" will be celebrated on October 3, 5, 10, 14, 16, 19, 24, 26, 30 & 31. "Mickey's Very Merry Christmas Party" will be held November 30 and December 2, 4, 5, 9, 11, 12, 14, 16, 18 & 19.